Thanks for the kind words. To retain the conchos, i attach a solid brass chicago screw to the back of the coin. Sand it, put a drop of soldering paste, hold it with a clamp and set it on fire. If i want to settle a snap, i change the male part of the screw for a smaller one. I got no merit, i saw this method on leatherworker.net a long time ago and i think Corter posted it on the old PYC thread. This was an early attempt laying around, by now my doming is much more regular and pronounced. 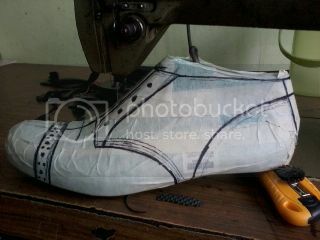 I'm surprised to see that the natural chromexcel would change that much. Has the wallet been treated? Looks awesome either way, new or used! 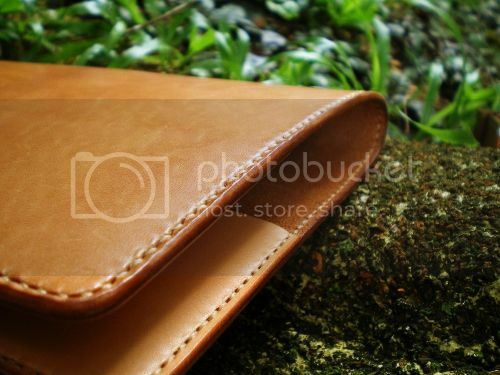 Nice wallet guys, corter leather looks nice . moonshine* great jobs nice vintage coin. 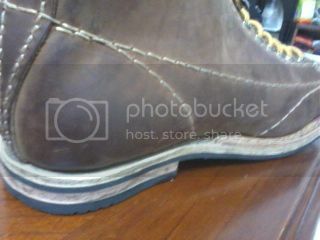 Started a 2nd project...cap toe military style ankle boots. where do you guys get source your leather cord from? I hear the quality on the leathercordusa.com is sub-par. any direction would be great. thanks! 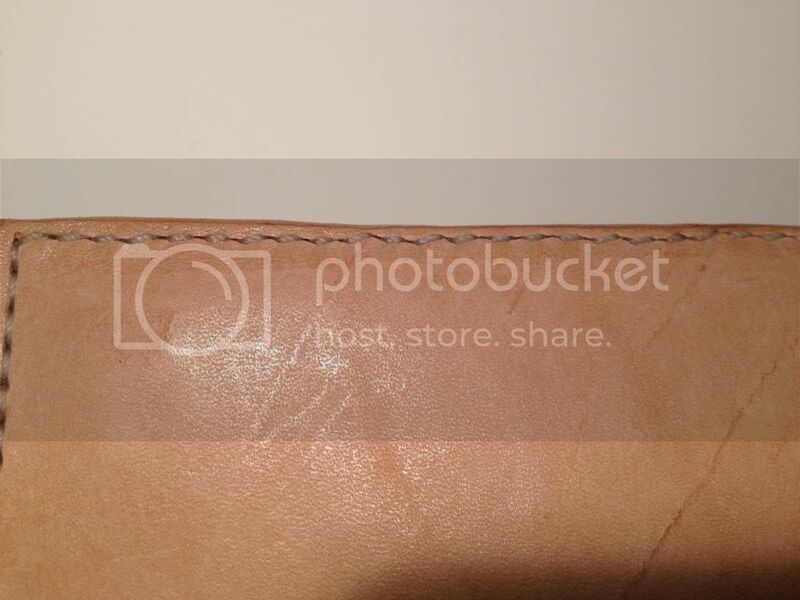 With the way quality and inventory has been lately, I'd love to never order from leathercordusa again. The natural cxl got obenauf's once I think, and a light coat. It's a little less red than it looks in the photo, but not by much. I love it. 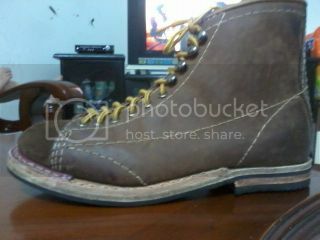 Boots look great, spidereye, such an complex project. Looking forward to your photos of the next one. 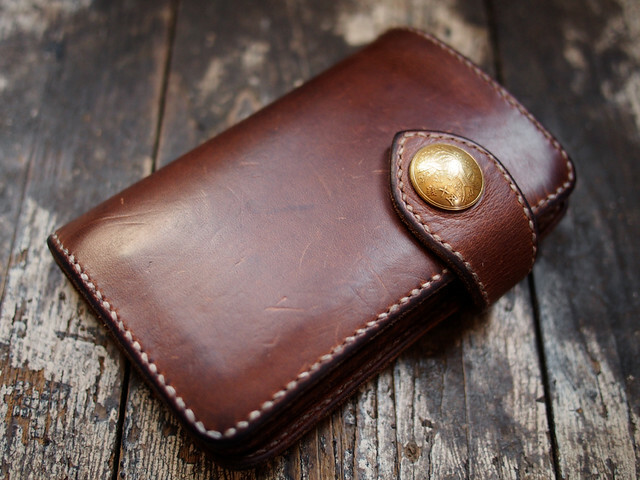 Tried my hand at a gusseted wallet. 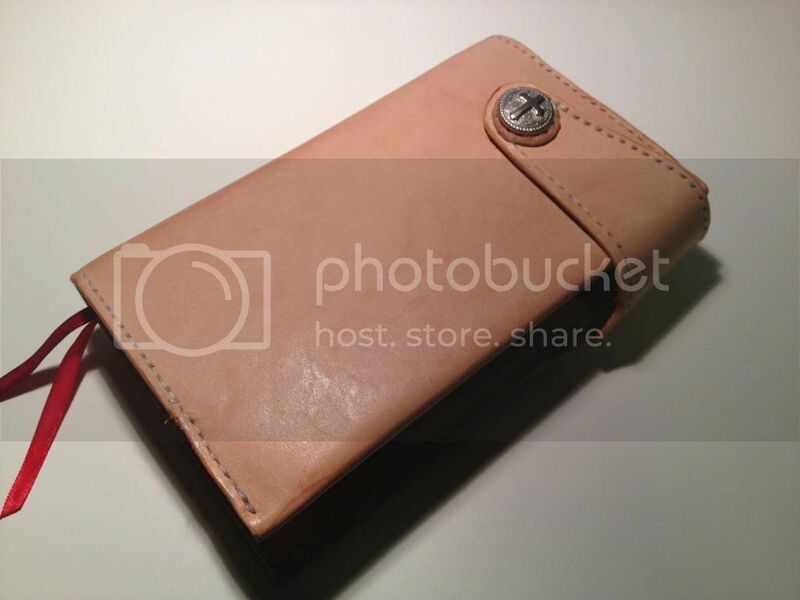 It has a clear pocket on one side and two card holders + a larger section on the other side. 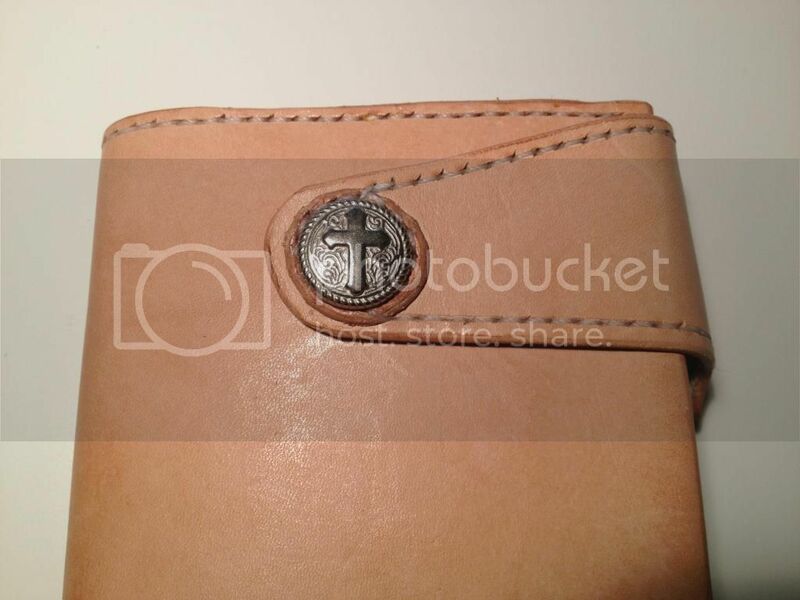 Second pic is a bit blurry at the top but shows the inside. Thanks dude! Crazy experience for sure, dealt with like 20 different people just to get that one paragraph written. Just wish they hadn't murdered that sample before photographing it, no clue how they beat it up that much. And yea Joey, that's how you do it! Good job dude. Quick project update : now working on the outer part. The yoke construction is pretty tricky with so thick hide. Really happy with the result. Sorry for the pics... Really need a better camera and a cheap light tent for final shooting. 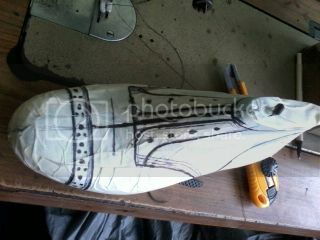 JOey Looks like it is going to be really cool when its done(awesome details)...Lining makes it much more finished. 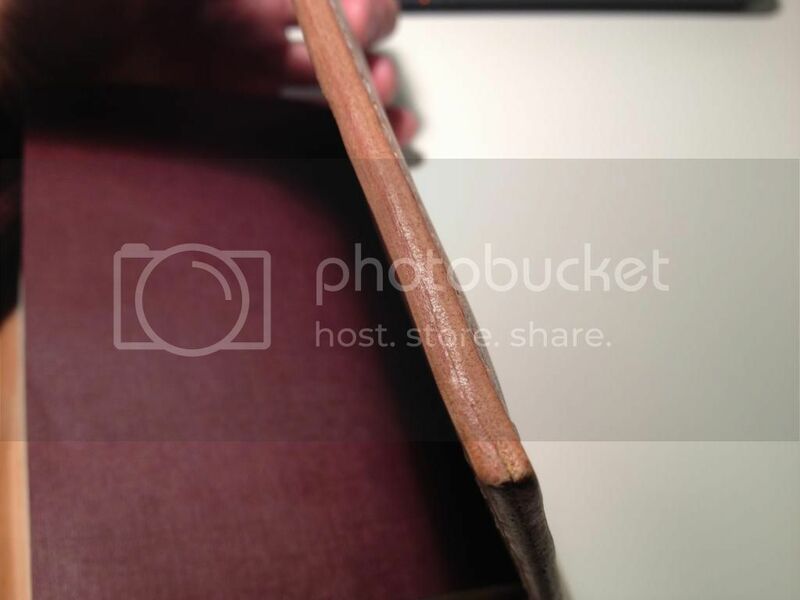 How thick will it be after it is completely done? Thank you dude ! To be honest, i wasn't sure about the cotton duck. The first plan was to pick a nice smooth pigskin to make the lining but i was really uncertain about which color will match nicely with natural saddle leather (something like burgundy or english tan probably...). So it end with this cotton duck which is really nice (super heavy, organic, unbleached...), but will use pigskin in future project, for sure. 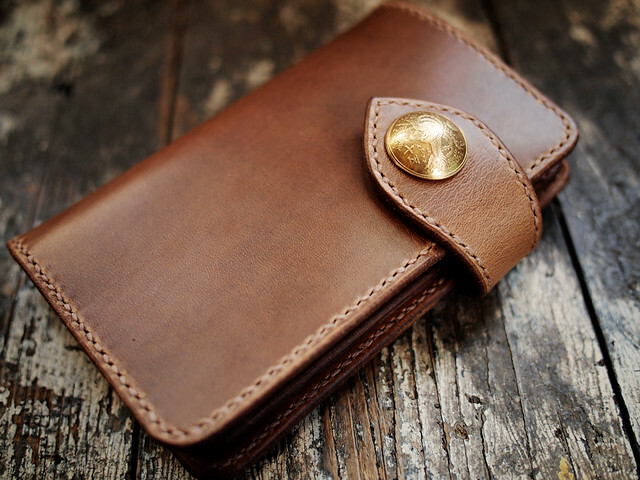 Not sure about the final thickness, but it's clearly not a slim wallet. Probably about 1"1/4. How do you guys keep your work so clean? My leather gets all smudged up after cutting, glueing, sewing and burnishing. Great project Joey. Keep the updates coming. I wash my hands every 30 minutes, use masking tape, paper sheet and cloth to hold and protect the piece i'm working on. I try to keep a clean benchtop. Oxyalic acid helps to remove minor stains or light greasy fingerprint. I believe its hand stitched. Nice and clean job so far! Although i'm not too sure about the construction. It may not fold properly and even if it does, it may be difficult to retrieve notes. Unless that part is still not finished yet? 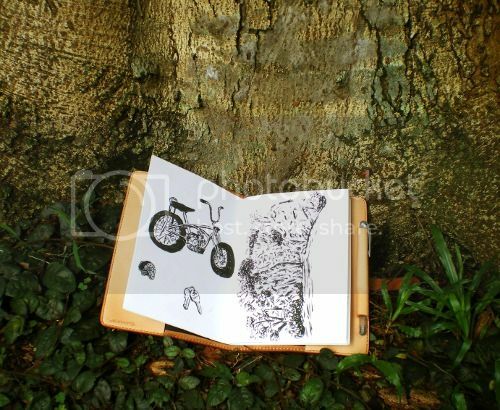 What I have been working on recently - an A5 notebook cover custom designed for a friend. 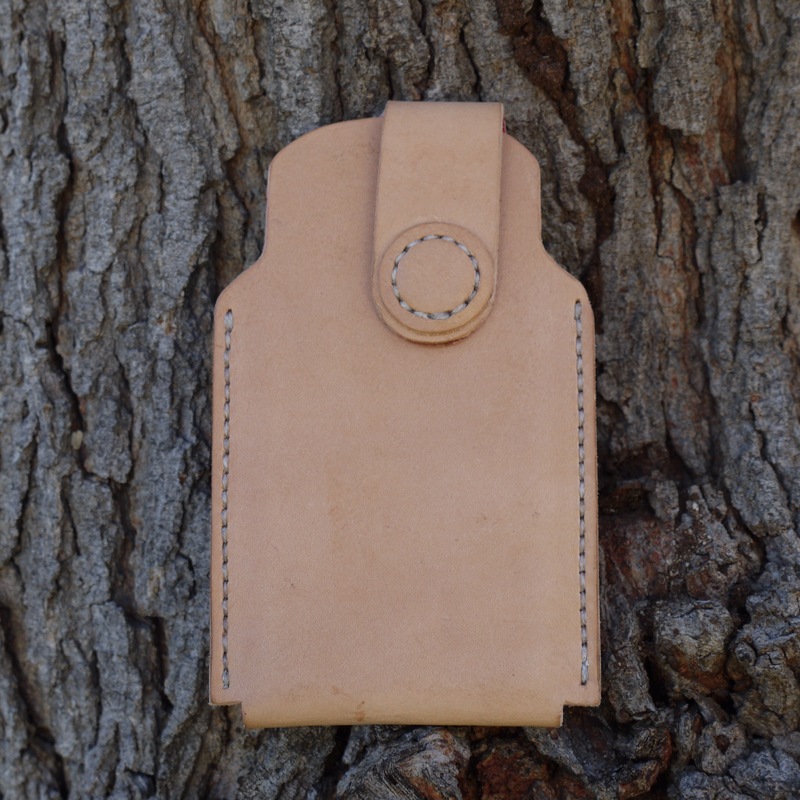 The arrowhead pocket for the strap was his idea. @lazybum : not finished yet. I'm gonna make a "central folding welt" (not sure about the term). I guest it's what you're talking about ? I made a model in PVC flooring material and it worked pretty fine. Would gladly take any advice from you for this part. 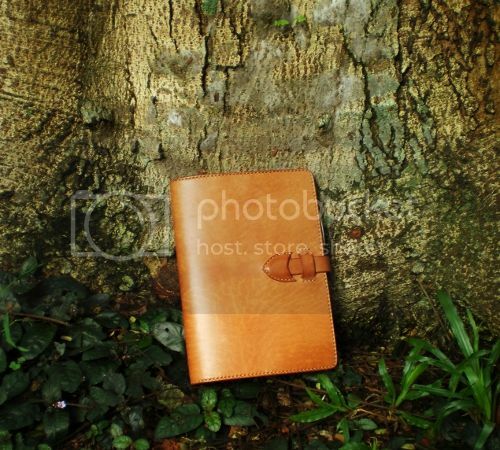 Anyway, nice notebook cover. Love the color. @lazybum : not finished yet. I'm gonna make a "central folding weld" (not sure about the term). I guest it's what you're talking about ? I made a model in PVC flooring material and it worked pretty fine. Would gladly take any advice from you for this part. Thanks. 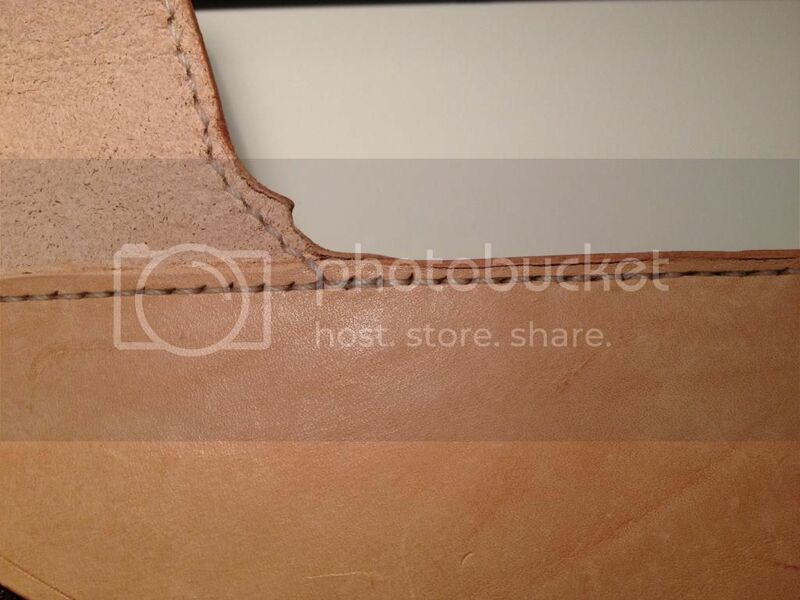 The color texture of horsehide is lovely. Yeah I think we're on the same page. 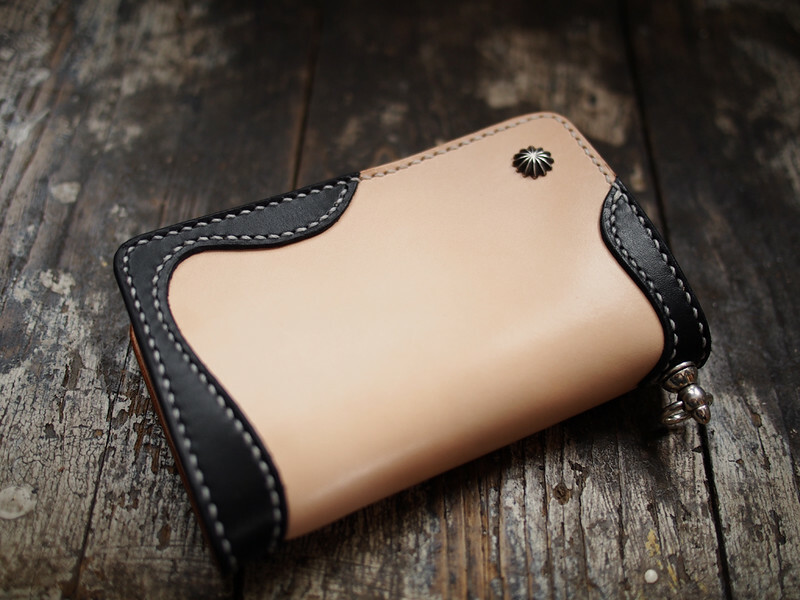 As long as the inner layer is shorter in length than the outer shell so that the wallet can fold properly. I usually settle that portion first before putting anything together so I thought you missed out that step. 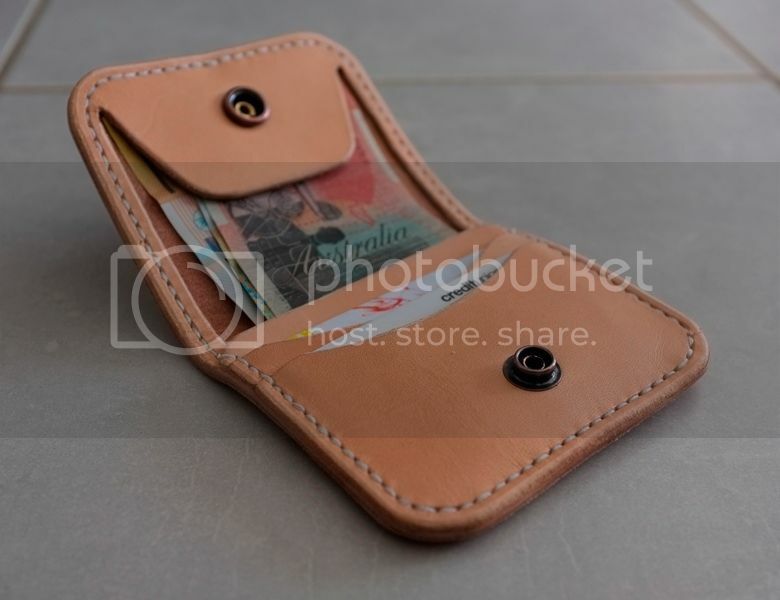 Hum interesting because i though that settling the interior part (card holder and coin pocket) before making the folding welt was the best way to keep everything in the right place both folded and open, even if it's trickier to do the weld at the final step. iPhone 5 case I made for my brother for Christmas. Thanks dirty 30. Not yet. I am going to make one for myself soon. And will try and do a making of style post. 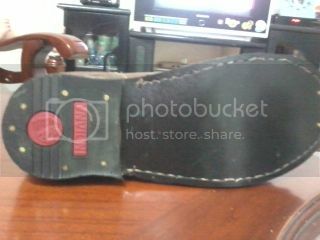 I am going to make a few minor tweaks to how the belt loop attaches. Custom mid with some fancy sterling bits from Japan. 1.Stitching holes don't lineup. I used an awl to poke holes for each stitch but I can't really control where the awl coming out on the back side. Do any of you guys know how I can get better? 2. Round edges don't look round. I used an xacto knife but I can't get the edges round enough to look professional. Can I get a nice round edge without a punch? 3. For cutting, I used an utility knife and a xacto knife. Both of them don't cut curves easy. Do I need to get a round knife or a Japanese leather knife for that job? I spent a lot $ on this hobby already so I don't want to spend a lot to get punches or those chisels (they aren't too expensive compare with a good knife, but can get pricey when I need different sizes). Thanks for anyone who can give me some advice! Daaang, that's some DIVINGHEADBAT style thickness. Good stuff, Joey! That thing looks beefy!